A SAP (Standard Assessment Procedure) is a number of calculations, including heat loss through walls, floors, roofs, heating and hot water, lighting etc, works out how energy efficient a dwelling is, showing a scale of 1 to 100 - from poor to excellent. 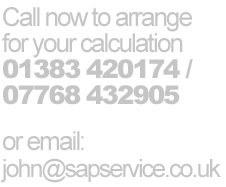 SAP 2005 works on a comparison basis that your house design was built to the 2002 Building Regulations, it will now from 2006 and onwards, have to be 20% more efficient. So, for example, if the house cost £100 per year to run in 2002, in 2006 onwards it will only cost £80 per year to run. The SAP Service operates on an ethical basis, drawing on many years experience to get the best results for your design, we can advise on the best construction to suit your requirements.